Denys & Fielding all began with the search for garden furniture. In fact two searches. By two sisters. Neither of us could find quite what we were looking for. And so we decided to make our own. 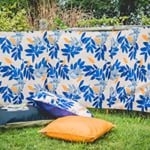 Bright bold prints inspired by thirties and forties dress prints are combined with sturdy, solid wooden deckchair frames to create a range of fun loving but practical garden furniture. 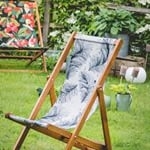 Our deckchair slings look great, but are also removable and machine washable. Our extra large floor cushions come with their own water resistant bottoms. 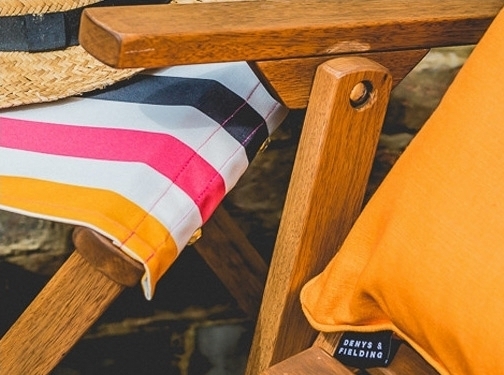 Along with two further sized cushions, they are great to mix and match with our wider collection of deckchairs and accessories and are extremely useful whether indoors or outside. Accompanying our garden furniture range is a set of essentials for outdoor living. Pots, planters, herb seeds, garden aprons and much more. We also offer a deckchair hire service for weddings, outdoor parties and special events. Please visit our website for further details, or keep in touch via Facebook for offers, promotions and news! UK (Kent) based business providing garden furniture and furnishings for sale. Website includes e-commerce facilities, delivery and returns information (within terms and conditions), press mentions, regularly updated blog, full contact details including company registration number.